Must possess a current qualification with NCCCO as a TLL and TSS operator. Must have at least a CDL Class B permit and a current medical card. Must pass a drug test as well as a background check with RapidGate allowing access onto US military installations. This is a 40-hour week position with occasional overtime. Must be able to read and interpret all load charts as well as interpret hand signals. Must be able to work with minimum supervision. Must be able to lift 50 lbs on a consistent daily basis. Must apply safe rigging practices and crane operating practices at all times. Must perform daily inspections and greasing of any crane assigned and document such. Must be willing to work odd jobs in the yard when not operating a crane. Must be safety oriented, have a good attitude and attendance. Must be able to exercise good judgment in load handling, placement of equipment, machinery and material. 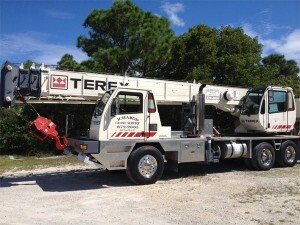 Ichabod Crane Service is a small, family operated business located in the Florida Keys. We primarily offer taxi service for the US Coast Guard, construction companies, air conditioning companies, landscape services, among others. There is much diversity to the type of lifts we perform and our safety record is unblemished. We are committed to offering a good work environment to the appropriate employee. If you are interested in this position please call the number at the top of the page. Have a project that requires our help? or click the button below to go to our contact us page. Copyright 2013 - Ichabod Crane Service, Inc.